Birding: eagles, herons, pelicans, egrets, falcons, cormorants, and more. Animals: turtles, alligators, deer, otters, and sometimes wild boars. Crystal River Indian Archeological Park and Indian Mounds are seen from the water. Tours are at 7:30 and 11:30, please arrive 30 minutes prior to the tour departure. Please check the times for your specific tour. On this sightseeing boat cruise, the sun will be at its highest point. Excellent for photographic opportunities. Leaving from our docks behind the Days Inn Resort in Crystal River, we set our course down the Indian River waterway to Kings Bay. Passing by beautiful waterfront homes and then cruising the shores of the Crystal River Indian Archaeological State Park, where the earliest use of this land was by native Indians over 10,000 years ago. We will also view a state owned wildlife management refuge areas. 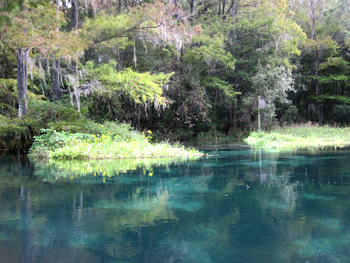 Here you will have a chance at seeing many different species of wildlife and attractions including the Indian Ceremonial Mound Complex, wildlife refuge for salt & freshwater species of fish, wild pigs, whitetail deer, American bald eagles, dolphins, otters, alligators, many different wading birds, and manatees. Around each bend of the river are unspoiled images to pause and capture. This Crystal River sightseeing boat cruise is approximately 2.5 hours long. You must arrive 30 minutes early. We will not hold the boat for late arrivals.